Southern Rock didn’t die it just went underground. There are plenty of catchy riffs superb guitar playing and seething lyrics. “ Holding All the Roses” features 12 total ear worms beginning with the mid tempo rocker “Let Me Help You (Find the Door)”. The title track is my favourite, starting with a huge drum beat, piano and an acoustic guitar riff that morphs into an electrifying riff that would do Govt. Mule proud. It also features a finger frying fiddle solo dueling with a couple blazing bluegrass inspired guitar solos and finishing with a finger bleeding face melting electric guitar solo backed by an unstoppable beat that just makes you want to press repeat. The title track epitomizes everything I love about southern rock and what I love about this CD — a melding of a variety of different musical styles from rock and roll, blues, a touch of honky tonk country, bluegrass and a smidgin of metal. The Cd has an even mix of crunchy riff heavy rockers and mellower material. You’ll find fiddle, some subtle steel guitar and honky tonk piano sprinkled throughout all of the songs. 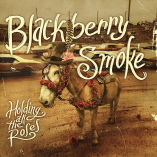 There is enough variety on the CD to make just about the perfect crossover between today’s ’70s style rock and roll revival and modern Top 40 country though Blackberry Smoke has plenty of the grit and rebel spirit sadly missing from modern country. They always tell a great story like on “Lay It All On Me” and these boys sure know how to play their instruments. “ Wish In One Hand” features a pair of harmonized guitar solos which has become somewhat of a lost art. They slow down with the haunting “ No Way Back To Eden” which takes you back to the mellower side of the ’70s. It is a Cd full of ’60sish instrumentals and jagged, straight ahead quirky, surf punk that is as much fun a a concept album about killer robots can be. Their songs are interspersed with ’50s style science fiction radio drama dialogue. They have some catchy quasi-instrumentals like “ Evolution is Slow,” and the CD ending “ Ghost Tree which are reminiscent of Shadowy Men From a A Shadowy planet. While there is nothing quite as twistedly brilliant as “Shark Attack”, there are some inspirational moments like “Party on the Moon” and the title track, which though it is about robots, seems eerily relevant today. 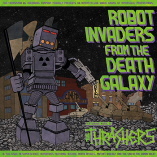 The title track “ Robot Invaders From the Death Galaxy” reminds me of a lost track from original L.A. punks the Angry Samoans. The adenoidal vocals on other tracks like “ Unknown World” and “ Webbed Feet” are reminiscent of Jello Biafra and the Dead Kennedys. At a spare 29 minute long the10 tracks on the CD will take you on an escapist journey into your favourite pulp fiction science fiction novel. Last year a Vancouver band called the Binz released a similarly themed album about killer robots. So here’s hoping killer robots will usurp vampires and zombies as the pop culture flavour of the day. 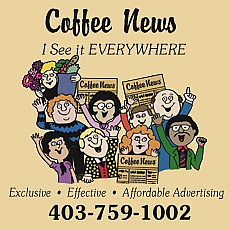 Though the Thrashers have a catchy number called “Zombie Twist” that wouldn’t be out of place alongside “Monster Mash” or songs from the Rocky Horror Show. With Montrealer Paul DesLauriers, his band is all about the guitar. And there is plenty of it on the 2013 Maple Blues Awards guitarist of the year’s new self titled CD. The power trio also including drummer Sam Harrisson and bassist Greg Morency rip through a high energy set of high octane, guitar fueled blues rock. For extra power, he brings aboard MonkeyJunk harpmeister Steve Marriner to play on two of the immediate highlights “ Going Down Slow” and “ She Should be Mine,“ which launch this CD into the stratosphere with a massive wall of sound of guitar, bass, drums, Deslauriers ’ huge voice and Marriner’s harp. Together it is reminiscent of Pat Travers and even a touch of Rory Gallagher. My favourite track, “ She Should be Mine,” should be the national anthem for the land of the lovelorn for every guy who’s crush is with somebody else. He brings things back to earth on the power ballad “Baby Come Home” for which DesLauriers shows off his leather lunged pipes. The hot instrumental “ Green Stripe” has a surf feel to it while “ Blame You” has an unstoppable blues shuffle. In addition to DesLauriers’ hot originals, the trio also puts their stamp on blues classics including lengthy jams on Buddy Holly’s “ Not Fade Away, blues classic “Baby Come Home” and a mellow seven minute jam on Robert Johnson’s classic “Love In Vain” which features some spooky slide guitar. He also holds back on the slightly slower “Nobody’s Fault But Mine,” which starts slow while featuring some raunchy slide playing then takes off for the last minute and the guitar solo. The “Not Fade Away” jam takes a couple of weird twists and turns but brings the CD to a crashing and satisfying close. The CD is mostly powered by Savage strumming an acoustic guitar singing world wearied stories and sounding very similar to Bruce Springsteen mixed with cats like Todd Snider and Hayes Carll. He has a knack for a turn of phrase like in “Don’t Plan on Starting Now” on which he sings “ Where have all the good men gone, well you’re looking right at one. I’ve never let you down before and I don’t plan on starting now,”’ which is punctuated by a twangy and tasteful guitar solo. He also shows some nimble guitar picking on tracks like “Hold On to the Sound” which also has a really pretty, mandolin solo in the background. He also shows off some tender picking on “Nothing but A Bad Dream,” which sounds like something Paul Simon might have written. It all comes together beautifully on “Skinny Kid” with pretty guitar playing and world wearied lyrics. MacKenzie Blues Band show a whole lot of soul on Slam! Bam!